Travelling southeast from Freetown, Sierra Leone’s capital, towards the eastern provinces, eventually brings you to the unpaved roads that lead to the Gola Rainforest National Park, one of the few remaining tracts of rainforest left in the country. Rivers and streams alternate with villages whose huts are roofed with straw or brightly painted corrugated metal, along with rice paddies, oil and coconut palm plantations and cacao and coffee plants growing in the shade of kola nut, mango and cashew trees. This precious yet difficult land was not only the epicenter of the civil war that lasted from 1991 to 2002, but also one of the areas worst hit by the Ebola virus 12 years later. Only a small fraction of this primary forest remains: 80% has been damaged by illegal mining, unauthorized logging and large-scale agriculture. Many associations are working here to save this invaluable ecosystem, including Slow Food. Food communities, food gardens, Ark of Taste products, convivia and the Kenema Kola Nut Presidium (which for several years has been supplying Piedmontese brewers Baladin with nuts for their cola) all involve a network of farmers and citizens who want to make sure communities have access to good, clean and fair food. The cultivation of kola is traditionally linked to the indigenous Mende and Gola peoples and the nuts are primarily used in energy-giving beverages, as traditional medicine and to dye textiles. The effects of climate change, which have been intensifying over the past few years, have reduced and delayed the kola harvest, but working with Slow Food means at least the producers have been able to enter into partnerships with national organizations and take part in new events. “It’s mostly the women who bring the kola nuts from the forest or the community gardens to the village where they will be processed,” explains Fatmata Mansaray, the Presidium’s treasurer and bookkeeper. 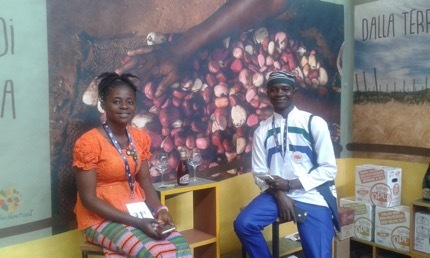 “They’re responsible for the processing phase and are often in charge of selling the product to buyers, who come from surrounding regions but also from Mali, Guinea and Liberia.” The Kenema Kola Nut Presidium currently involves over 200 producers and farmers from three different Slow Food convivia, who joined together in 2012 to create a single company in order to boost production, develop kola-nut processing techniques and obtain a better price on the market thanks to improved quality. Women also play key roles in the area’s farming communities. 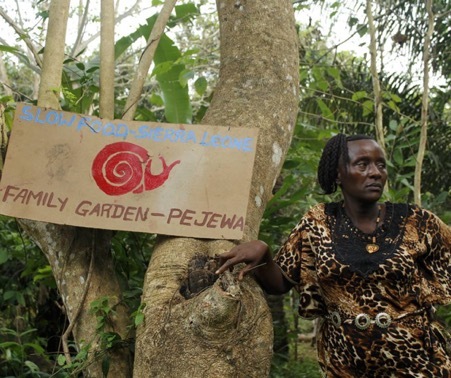 For example, in one of the convivia, in Gegbwema, the town chief is a woman and also a member of the kola producers’ association, while Aminata Amara from the Madina Convivium in the Kailahun district is a Slow Food member as well as the coordinator of a large food garden close to the village of Pejewa, named after her family.